After graduating from the leisure science program last year, Marilyse Roy-Viau, affectionately nicknamed Red by teammates, is back at Concordia as the director of basketball operations for the Stingers women’s team. The former starting forward and team captain met with head coach Tenicha Gittens after last season. She indicated to her that she wanted to continue being involved with the team in a coaching capacity and wanted to remain in the basketball community. Gittens then offered her the position of Director of Basketball Operations. Her responsibilities include paperwork, logistics, travel accommodations, managing the players, keeping the team on a schedule, and keeping track of statistics accurately. She also does a bit of coaching sometimes, but that isn’t one of her primary roles, yet. The job is a first step in what she hopes can become a career in coaching. Roy-Viau has a different, flexible full-time job that allows her to come to practices then go back to work. She coaches the College Jean de Brebeuf men’s basketball team. Gittens says that she can definitely see Roy-Viau coaching in the future and that it’s good to see old players come back, but that she wouldn’t have given her an assistant coach position right off the bat as she isn’t far removed enough from the team yet. Former teammate, Caroline Task, says that since Roy-Viau was in her fifth year while Task was in her first, she would look to Roy-Viau’s advice. “It’s not a big change and I’ve always really liked Red so it was an easy fit for her to come right back into the team,” she said. Gittens likes having Roy-Viau on the staff because she’s close enough to the players that they can lean on her and her experiences and she can relate to them. She can be both in the locker room and on the sidelines with the coaching staff. Gittens also says that the team takes the encouragement from Roy-Viau in the same way they take encouragement from a teammate and that it holds a different weight than the encouragement the coaches give. Roy-Viau said she misses the team incredibly. Roy-Viau hopes to one day be the head coach of a university team, either in Canada or in the United States. For now, she just want to keep growing as a person and as a player. 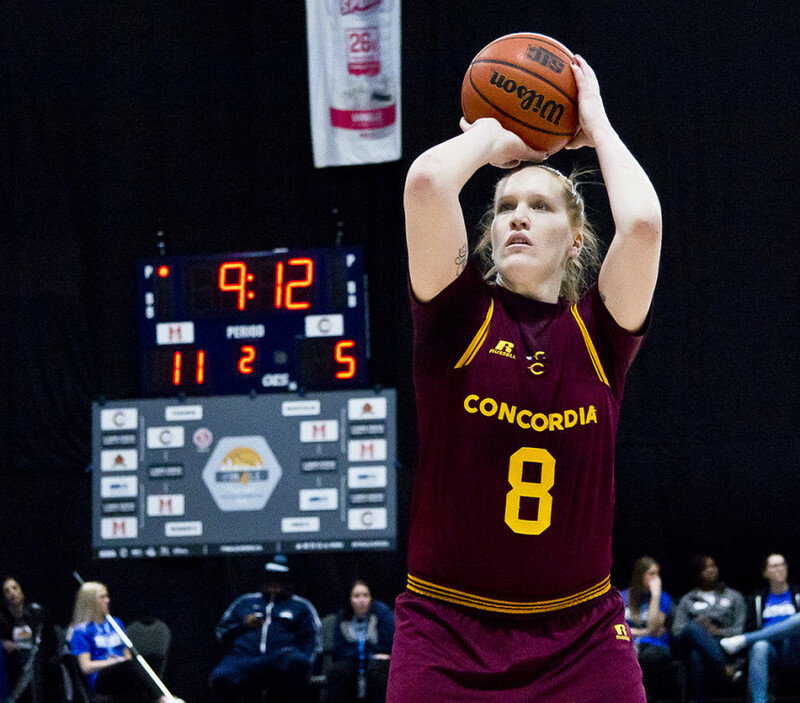 Since the basketball program is going so well here at Concordia, according to Roy-Viau, she wants to stay here and learn as much as she can.